Thanks for the warm welcome Dry Bean. If you don't mind sharing the upgradis story that is. You haven't had the Minore that long. Craig from 9Bar dropped in a new 3-group Synchro - fresh off the boat from BFC in Italy. It's only 10:30am and I've had 12 espresso already..........each one better than the last. I had a couple of really nice shots out at Foxy Brown from one of these. Whats fancy on the newer ones? To be honest, it's my first Synchro so I can't really compare, but I know there are slight improvements going on all the time - Craig has a very strong relationship with the designer and builder. I do know there will be a new mod coming in soon, but I can't disclose that one unfortunately. This one has flow restrictors installed and the 9bar guys have calibrated the temp to suit one of my custom blends so well it's insane. 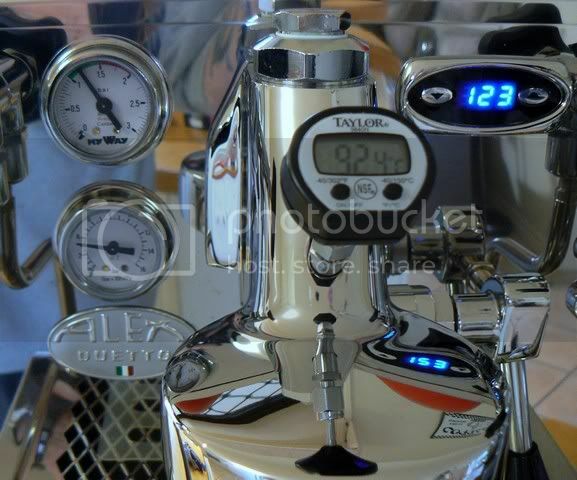 Alas, I have but 7 days to play.........the machine will be in the back of my van next Friday and making it's way to Mildura's best cafe - Cafe94, where they pump out 3500+ perfect coffees each week - so it will be getting a good workout. If I had some suggestions, it's make the High-Group a bit higher so that 16oz cups fit neatly under the PF and perhaps a slightly longer steam wand, but that's an easy fix. I haven't tried the multiple boiler yet but honestly I'd be surprised if it makes significantly better coffee than my machine - I can still run a 30ml extraction from triple sized baskets out to 60secs plus extraction time without blonding or burning the shot - due to flow restrictors both at the heat exchanger and at the group head, to produce an amazing espresso or double espresso - and I'm yet to try another machine which has the same capacity to run extra long extraction times - which is not to say that such a machine does not exist, but I havent used one even though I've worked on plenty of machines! Just popped new blades in the Compak K10 and in the Robur, and bought aDitting dell grinder off my roaster - so I feel that we're pretty sorted in the equipment department! My wife and little girl are currently in FNQ visiting family and I'm wondering, does anyone here think that I could get away with replacing my Splendor with this baby and would my wife notice? They look kinda similar if you squint and I think that this would hold the upgraditus at bay for the domestic user for at least 12 months. Have heard some interesting stories about this one circulating within the industry - but I'm not going to share. but I'm not going to share. No need to, enough said. Gold Sniff... LOL! The big hole with a red minus sign in our bank account may also be a give-away! I think DB has nailed it with enough said! Yes I will give the EM0480 a try and see what happens, I still like my manual grinding though. I'll get my OH to read through all the threads and do the adjustments everything needs as soon as he can, in the meantime I'll just trial it the way it is. I've recently purchased a smart grinder ($240) and a em6910 ($498). I've also got coming a pullman tamper and vst basket, hopefully arriving by friday so i can start playing this weekend!! Have also been looking with keen interest at naked portafilla's, but will look into buying one a bit later. My beans are bought locally, mostly from Coffee Barun and i'm wanting to get some more 5 senses beans, I probably buy every 2 or 3 weeks, roughly. Using local milk - tweedvale or pariscreek and filtered water always. I wont go into exactly how i'm going about making my coffee but will leave that for the other thread on em6910's, which i will post sometime. Just thought I'd add a couple of pics of my setup. And the Azkoyen bravo is currently in pieces in the garage. So Espressigo - that's gotta be a custom build.... except you imply there are others. Either way, I used to have a couple of Indigo's floating around, so I think it's awesome. The espressigo was made by Silicon Graphics Germany. Not sure how many were sold, but it would have been over 100. They were popular at silicon graphics sales offices and at least half a dozen in silicon graphics head office. I saw that Brett, does it have a long knob? That's a bit personal but seeing as we are here alone... no! I was shopping for a long knob and came up quite short. Fortunately the size of this baby is no relation to it's abilities!